11/12/17: From Hemp To Houses? A major marijuana plot twist occurred at this week’s Encinitas City Council meeting. In a startling about-face, growers Dramm & Echter, who had previously requested to grow marijuana on their agriculture-zoned property, have now proposed an “agrihood,” where residential homes are built around a working farm. Agrihoods are somewhat similar to developments surrounding golf courses, but instead of playing a few rounds, homeowners can gather free fresh produce. Agrihoods sometimes feature cooking classes, farming instruction, farm-to-fork dinners and other urban agriculture ideas. Owner Bob Echter is not proposing any marijuana to be grown at the working farm in this agrihood. 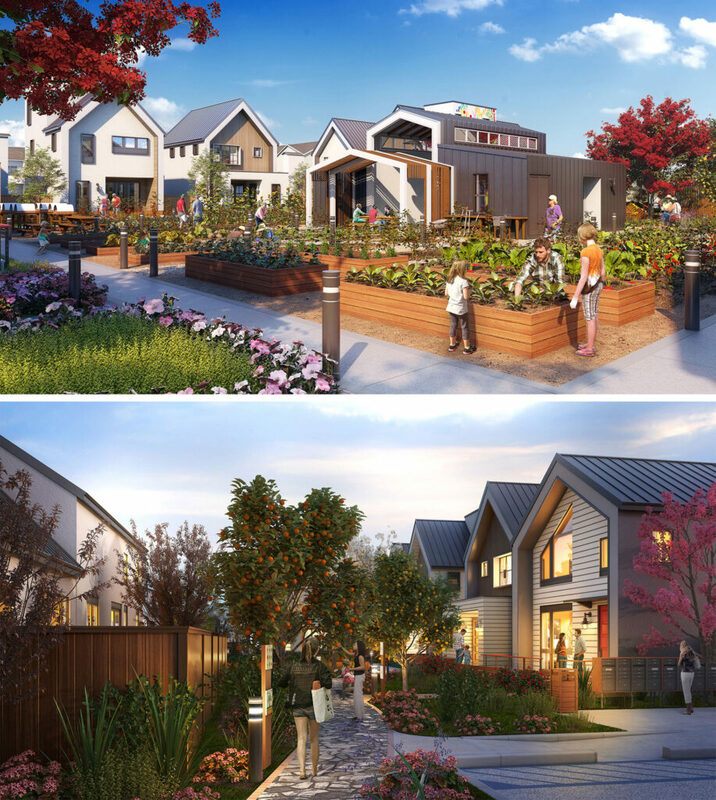 Artist renderings of the proposed Fox Point Farms courtesy of KTGY. 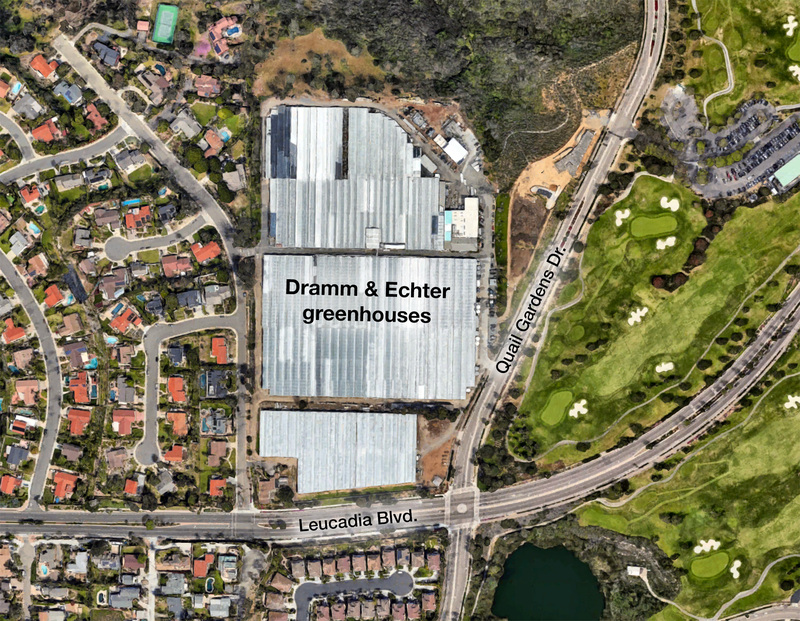 This surprising new proposal occurs at the intersection of two hot-button issues in Encinitas – the potential commercial cultivation of marijuana, and the state-mandated housing plan. Echter, a second generation Encinitas farmer, owns 21 acres where he grows mainly gerberas, lilies and roses. Increasingly expensive water, salary and regulatory costs have made it more difficult to sustain agricultural businesses, and Echter has been feeling the pinch. As a result, this year Echter requested that the city allow him to grow marijuana on about 10% of his property. This generated tremendous controversy and the City Council created a subcommittee to take public testimony and offer a recommendation. The committee did not reach consensus, offering a split recommendation. The City Council then took up the matter and decided, in another split vote, to allow Encinitas voters to decide the issue. Apparently, an unpredictable November 2018 election outcome inspired Echter’s proposal for a working farm and a residential development of about 200 homes, instead of the pursuit of marijuana. This request is being made as Encinitas is wrestling with our citywide housing plan, which is required under state law to accommodate future population growth. We’re embroiled in three lawsuits over our failure to have an approved housing plan. 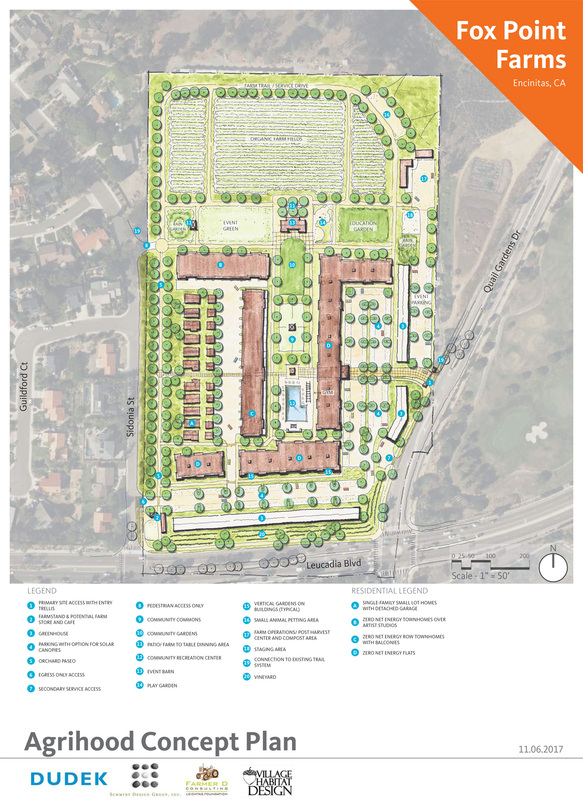 We need to upzone properties to accommodate about 1600 units of new housing here in Encinitas. Because of a previous growth control measure, Prop. A, any upzoning must be voted on by residents. Echter is requesting that his parcel be included in the upzoning that we’ll be taking to the voters in the election of 2018. If the Council includes his property and its proposed new homes on the list of upzoned parcels, there likely won’t be a marijuana cultivation vote on the ballot in 2018 because there would no longer be a proponent requesting it. That means the interim marijuana ban that we’ve just approved would likely stand, which would come as a tremendous relief to many Encinitas residents (but is objectionable to many other residents). I would love Encinitas to have the county’s first agrihood. It perfectly fits our city’s vibe. This proposal is just emerging and the details are scarce. I’m also open to hearing other agrihood proposals. I’d like to congratulate my City Council colleague Tasha Boerner Horvath for authoring districting map 16 that generated the majority vote at this week’s meeting. All maps were submitted anonymously, including Tasha’s two contributions. Anyone who watched the meeting or has talked with Councilmember Boerner Horvath knows that she has an unparalleled depth of knowledge and interest in virtually every census block of our city. I strongly believe that we each bring unique talents to our service in elected office; and we operate the best when we rely on each other’s strengths. Tasha’s data-driven and detail-oriented approach, combined with her indefatigable work ethic, perfectly aligned with the task of creating district maps. As Tasha said at the meeting, she closely scrutinized all the maps and then adjusted boundaries to accomplish goals such as keeping the Olivenhain Town Hall in the Olivenhain district instead of allowing it to fall in the Cardiff district. My goals for districting included keeping at least three representatives with a stake in the coast, maximizing representation of the transportation corridors (including I-5, Coast Highway, El Camino Real, and the rail corridor), minimizing incentives for provincialism, and retaining voters’ ability to elect both their district representative and their mayor. Tasha’s map accomplished all of my goals. This map also allows every current City Councilmember to have his or her own district, which means that in 2018 both Mark Muir and Joe Mosca will be up for election in their own districts and there won’t be any head-to-head contests between councilmembers. 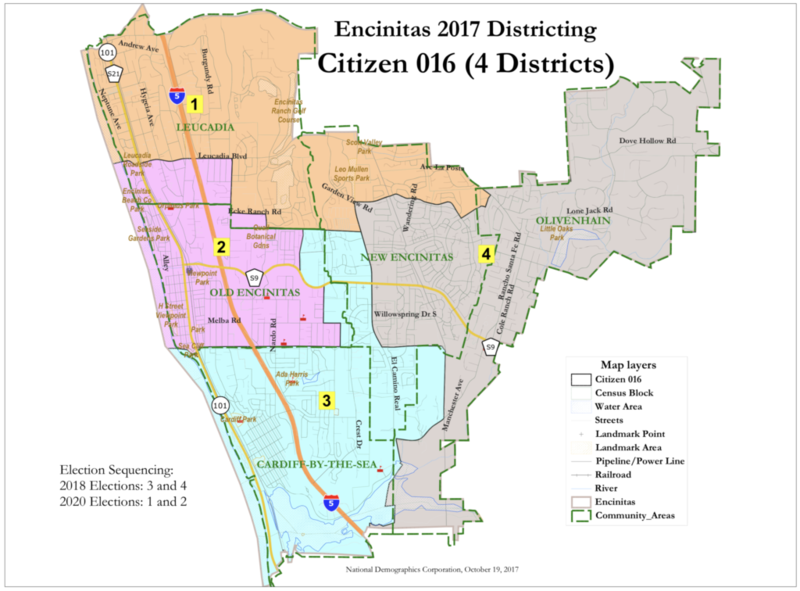 Here’s an Encinitas Advocate article about the decision. Also at this week’s meeting, we heard a detailed update on our ongoing Active Transportation Program, which enables us to systematically approach mobility, biking and walking, and connectivity projects. It’s an exciting concept that promises to make Encinitas a much better place to get around, whatever mode of transportation you choose. Finally, during this Veterans Day weekend, I’d like to take this opportunity to pay tribute to the sacrifices of the men and women who have served in the military, in wartime and in peacetime, to protect America, our values and our interests. 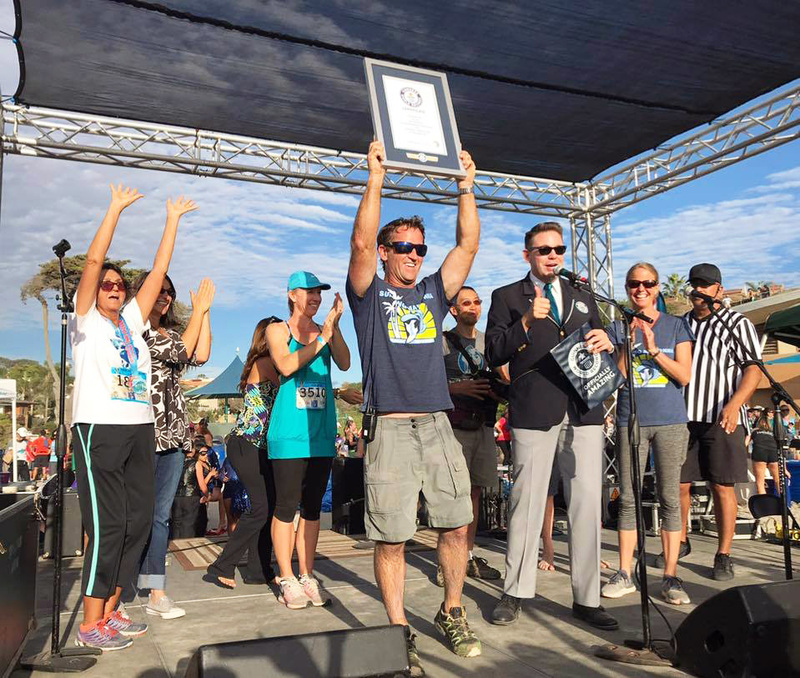 The Surfing Madonna Beach Run was a great success again this year, and we’re now Guinness World Record holders as the largest beach run in the world (see top photo of the race’s creator, Bob Nichols, accepting the recognition from the Guiness Book of World Records judge who came out to officially certify our success!) 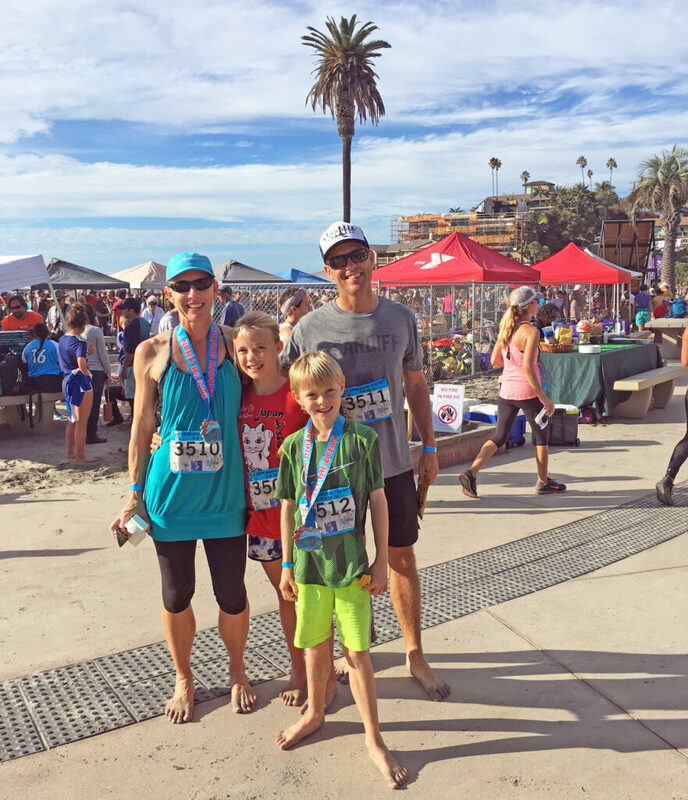 The Blakespear family (below) enjoyed racing barefoot through the waves in the 5K, along with thousands of our energetic friends and neighbors. Here’s the Encinitas Advocate story.